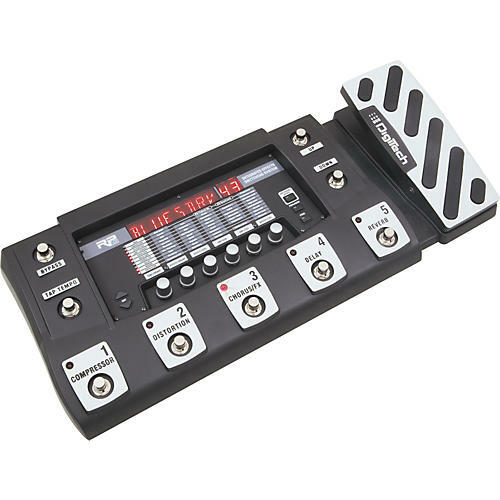 Get the best of both worlds with the DigiTech RP500 Guitar Multi Effects Pedal. The RP500 features a Pedalboard mode that allows you to turn on and off individual stompboxes and effects by pushing buttons 1-5. You get the expressiveness of stompboxes and you can change them from preset to preset. Next take the Amp/Cabinet Bypass button that defeats the internal amplifiers and cabinets leaving you with only stompboxes and effects and you have a switching machine. Save each combo in a preset for a uniquely switchable pedal setup found only in pro switching systems. The RP500 Multi Effects Pedal is built like a tank, from a cast metal chassis to the 9 vacuum-style switches. A large 10 character LED display makes for easy stage use topped by an built-in expression pedal to control wahs, volume, Whammy and other parameters. Your sound is king so having control of your sound is imperative. The DigiTech RP500 pedal gives you the control to express yourself the way you want-no longer will the lack of control stand in the way of your expression. *Other product names modeled in this product are trademarks of their respective companies that do not endorse and are not associated or affiliated with DigiTech or Harman International Industries, Inc. Ibanez Tube Screamer, Voodoo Labs Sparkle Drive, Guyatone Overdrive, ProCo Rat, MXR, Boss Metal Zone, Roger Mayer Octavia, Demeter Fuzzulator, Arbiter Fuzz Face, EH Big Muff Pi, Dunlop Cry Baby, Vox, Clyde McCoy Wah, MXR DynaComp, TC Electronic, EH Electric Mistress, EH Small Stone, Boss Octaver, Unicord Univibe, Fender Opto Tremolo, Vox Bias Tremolo, Maestro Echoplex, Fender Twin Reverb, EMT, Fender Tweed Deluxe, Fender Bassman, Fender Blackface, Twin Reverb, Marshall Super Lead, Mesa/Boogie, Hiwatt, Fender Tweed Champ, Soldano, Jensen Blue Backs, Celestion, Johnson Amplification and VHT Amplification are trademarks of other manufacturers and were used merely to identify products whose sounds were reviewed in the creation of this product.